February 3, 2016 – Engineers at Lockheed Martin recently proved their design for the world’s most powerful Global Positioning System (GPS) satellite can operate in and withstand the harsh conditions it will experience on orbit. On December 23, Lockheed Martin’s first GPS III satellite for the U.S. Air Force completed system-level Thermal Vacuum (TVAC) testing, validating the design of the entire assembled satellite. TVAC is a rigorous test designed to prove a satellite’s integrity and operational capabilities by subjecting it to prolonged cycles of simulated space temperature extremes in a special depressurized chamber. 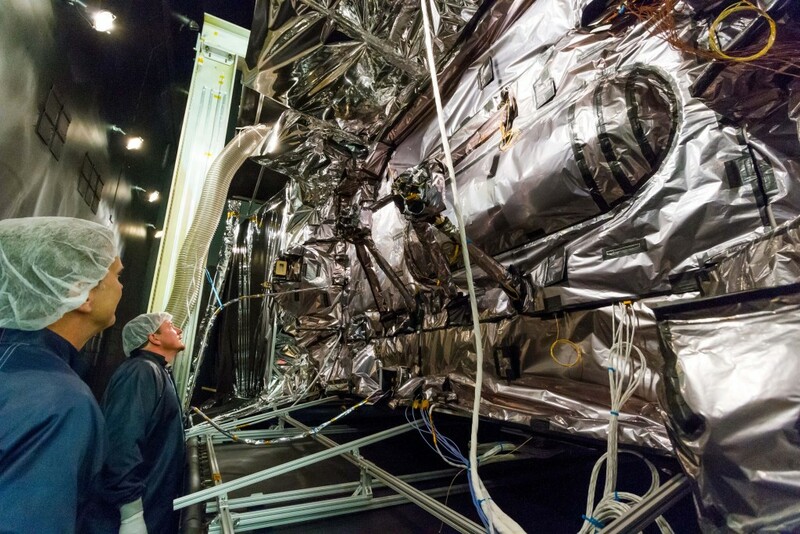 TVAC is the latest in a string of milestones for the first GPS III satellite. Last spring, the satellite’s major functional components were successfully integrated to form the first complete satellite. Last fall, the new satellite also successfully completed acoustic testing, where it was pounded with sound waves to simulate the vibrations it will endure during its launch. With eight satellites under contract, the production line is now on a steady tempo at Lockheed Martin’s GPS III Processing Facility outside of Denver. The first four GPS III satellites are in various stages of assembly and test with most major components — including their structure and propulsion systems, solar arrays, and antennas — already delivered. This spring, with Harris Corporation’s delivery of its second navigation payload, the second GPS III satellite is expected to be integrated and begin environmental testing. Components for the next four GPS III satellites are already being assembled, tested and delivered on schedule by more than 250 aerospace industry companies from 29 states. GPS III will deliver three times better accuracy, provide up to eight times improved anti-jamming capabilities and extend spacecraft life to 15 years, 25 percent longer than the satellites launching today. GPS III’s new L1C civil signal also will make it the first GPS satellite to be interoperable with other international global navigation satellite systems. The GPS III team is led by the Global Positioning Systems Directorate at the U.S. Air Force Space and Missile Systems Center. Air Force Space Command’s 2nd Space Operations Squadron (2SOPS), based at Schriever Air Force Base, Colorado, manages and operates the GPS constellation for both civil and military users.